Indicated for vitamin B deficiency (common in older people). Recommended for vegetarians and vegans. May improve alertness and cerebral protection. 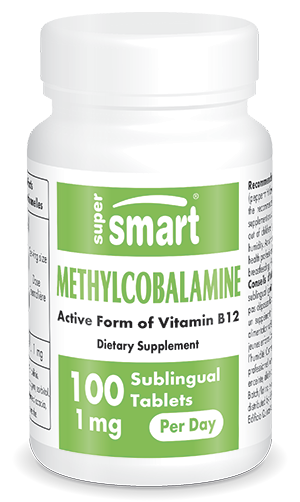 Our dietary supplement is formulated from a specific form of vitamin B12 (cobalamin) called methylcobalamin. The other forms of vitamin B12 are: cyanocobalamin, hydroxocobalamin and adenosylcobalamin. Methylcobalamin is a highly active form of the vitamin, hence its inclusion in the composition of this new product. Supplementation is particularly useful since vitamin B12 plays a number of roles within the body and is essential for good health. As humans cannot synthesise this B complex vitamin, it must be ingested daily in order to meet the body’s requirements. Vitamin B12 is involved in the synthesis, absorption and metabolism of numerous molecules, giving it a key role in the body. For example, it supports cell growth and renewal by participating in protein, DNA and RNA synthesis. As well as helping to maintain healthy skin, this function is essential for a number of vital organs such as the brain. Vitamin B12 is also required for normal nervous system function as it is involved in synthesising neurotransmitters as well as maintaining the myelin sheath – the structure that surrounds and protects nerve fibres. It also plays a part in lipid metabolism and red blood cell formation. Given the crucial roles vitamin B12 plays in the body, it’s essential to ensure an adequate intake of this vitamin, particularly as a shortfall may result in insufficient production of haemoglobin which is vital for transporting oxygen to red blood cells. If this is not addressed, it can lead to anaemia which is characterised by abnormally low levels of haemoglobin. In vitamin B12 deficiency anaemia, red blood cells are usually bigger than healthy ones. Generally known as macrocytes, these larger red blood cells do not permit adequate oxygen transport, resulting in poor oxygenation of the body. This manifests in various symptoms such as pale skin, a rapid heart rate, severe fatigue, breathing difficulties and headaches. Vitamin B12 supplementation may thus be necessary to prevent deficiency or combat the symptoms of anaemia. Although vitamin B12 can be obtained from the diet, deficiency is not uncommon, particularly among older individuals. Supplementation with methylcobalamin is indicated in such cases. This active molecule is also recommended for vegetarians and vegans, because foods that contain it are often animal-source, such as offal and seafood. Dietary supplements may therefore be necessary for those following a vegetarian or vegan diet. boosting the activity of natural killer cells and T lymphocytes. In order to offer a high quality vitamin B12 supplement, this product has been formulated using methylcobalamin. Its recognised activity in the body means it is highly effective at combatting deficiency. Scientific studies have also identified it as having significant potential for improving alertness and cerebral protection. Providing the benefits of this active form of cobalamin, this supplement contains an optimal 1mg of vitamin B12 per tablet, with a suggested dose of 1 tablet a day, although this can be adjusted in line with your needs and the advice of your therapist. You may also be interested in other vitamin supplements such as Triple C, our complete vitamin C formulation, and Daily 6®, our latest-generation multivitamin supplement. Other ingredients: Acacia gum, sorbitol, mint essential oil. Take one sublingual tablet a day for preventive purposes, or more if advised by your therapist. Precautions: Do not exceed the recommended daily dose. This product is a nutritional supplement and should not replace a varied, balanced diet. Keep out of childrens' reach. Store away from direct light, heat and humidity. As with any nutritional supplement, you should consult a health professional before taking this product if you are pregnant, breastfeeding or have a health problem. Free: our weekly science-based newsletter "Nutranews"
The wish list lets you save items you're interested in so you can add them to your basket easily the next time you visit the site. You need to be registered to use this service.